We’re excited to announce that Dark Theme support for File Explorer is ready for the next major release of Windows. With Windows 10 Insider Preview Build 17733, Windows Insiders will be able to see the latest UI design for Dark Theme in File Explorer by going to Settings > Personalization > Colors and select the “Dark” option under the “Choose your app mode” section. This latest design caps off months of work. With this article, we wanted to give you the inside scoop on how we got there — and how feedback from Insiders helped guide us along the way. Adding a dark theme to File Explorer has long been a top Insider request. Some users find that a dark theme is easier on the eyes. Others simply like the fresh, new look. But while dark mode has been available in Windows for some time, it hasn’t applied to File Explorer, until now. Here’s why: compared to modern parts of Windows, File Explorer was a whole different beast. While dark mode can be applied to modern XAML components in Windows quite easily, File Explorer contains legacy UI frameworks which don’t plug into that infrastructure automatically. 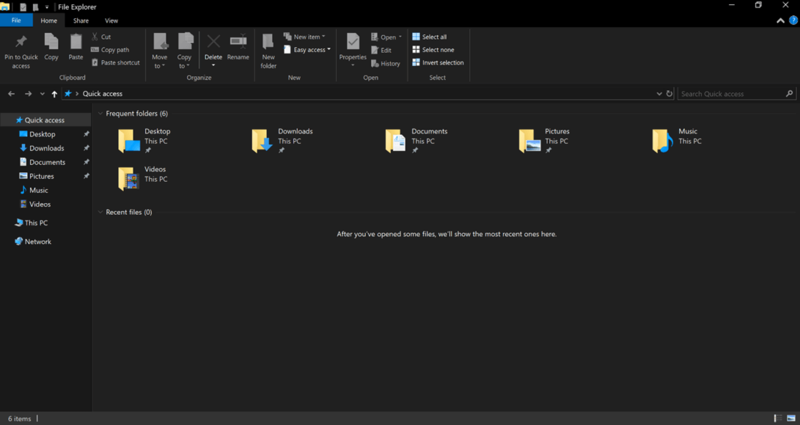 With File Explorer, we were literally breaking new ground to provide a dark theme to legacy parts of the shell. We also needed to be careful to only change File Explorer (and the Common File Dialog) and not change common controls generally, which could break a lot of app experiences (such as making dark text in an app unreadable). There was one additional challenge: getting all of this work prioritized along with other good stuff going into Redstone 5 (RS5). This is where Windows Insiders came to our rescue. In short, we made the case that more and more Windows Insiders were asking for dark theme in File Explorer and now it was time to deliver. Management agreed! We started working on applying dark theme to file explorer, and Insider Preview Build 17666 was the first build where Insiders started to see the fruits of our labor. The design process was a bit of a balancing act. On one hand, we want to keep the design consistent with the modern Shell experiences already part of the broader Windows dark theme. At the same, we also needed to incorporate lighter tones to ensure the multiple parts of File Explorer remained easy to see and work with. As you might have noticed, our colleagues on the Office team had been working on a similar challenge. In fact, File Explorer and PowerPoint have very similar design elements — and consistency with Office was yet another one of our objectives. As you see can below, our initial build was by no means perfect — but we knew we would get feedback from our trusted Insiders to help guide adjustments along the way. Sure enough, Insiders didn’t hold back. Feedback was amazingly valuable, right down to the smallest details. But equally important was the sheer volume of feedback — which in turn helped to confirm our initial decision to prioritize the work in time for an RS5 release. That led to the next iteration of the design below in Insider Preview Build 17686. The focus here was on fixing major bugs left over in 17666. Meanwhile, Insider feedback continued to pour in. We focused on addressing that feedback with Insider Preview Build 17733. For example, Insiders told us that they’d like to see more use of grey tones — which we added to areas like the view pane. We also adjusted the address bar and ribbon colors. (The effect is that your eye is drawn more to the content in the center of the screen.) And take a close look below at the Navigation Pane. We removed the folder backplates from the folder icons and enlarged the icons to make them stand out more on high DPI displays. Its detailed suggestions like these that helped us move from a basic dark theme into the kind of functional design that users demand, especially with File Explorer. And there you have it: Dark Theme in File Explorer — designed by Windows engineers and inspired by Windows Insiders from around the world. Thanks to all of you! We look forward to hearing more from you on our latest design — and other dark theme elements coming to Windows. As your recent feedback clearly shows, you Insiders obviously have an excellent sense for design!